in all honesty, i don’t think i’ll ever be able to recover from a book like this one. it’s left me – mentally, emotionally, and physically – a blubbering mess. i did enjoy this novel, but it was extremely heartbreaking. i’ve managed to continuously cry for an hour while reading this, and that’s saying something because i’m generally not a “crier” for books. a few watery eyes here and there, but while reading this there were real life tears streaming down my face. i just… i can’t. UGH. since this book was so awfully emotional, i’ve had a hard time writing a review. my thoughts and feelings are all over the place, but i’ll try my best. please bear with me. both main characters of this novel were complex, quirky, and entirely their own. the romance in this novel was absolutely adorable. 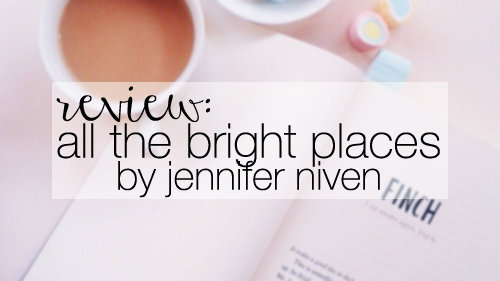 jennifer niven perfectly portrayed the harsh truth of society, labels, gossip, and more. through our characters, we see how easily and naturally our society labels people. if you’re rich, you must be happy, carefree, and popular; if you’re different, you must be “weird” and a “freak”; if you’re intellectual, it’s obvious you’re a nerd; if you’re depressed, you must be doing it “for attention.” it was incredibly sad to see how the inaccuracy and misinterpretation of our thoughts could affect a person. niven showed that not everyone suffering depression is openly sad, moping, or unhappy. the striking truth of depression and suicide was a constant reminder of society’s misconception. suffering depression and suicide is not something that is one’s choice. also, it was beautiful to acknowledge that not everyone is who they seem. there were characters categorized into these labels, but it was clear they were more than what other’s classified them as. it made me realize that everyone is complex and worth knowing. overall, i think this novel was very profound and moving. it reminded me of the fault in our stars (or any john green book, really) because it was so painfully emotional and deep. if you’re not comfortable with sad books or heavy topics like depression and committing suicide, then i wouldn’t recommend this book because it has a lot of that.. however, other than these minor triggers, i’d definitely want the world to read this (even though i know it wouldn’t be everyone’s cup of tea). it was a beautiful and wonderful debut novel and i cannot wait to see what else there is in store. side note: i also really enjoyed this novel because we get to explore indiana and see so many cute landmarks. i read/began it on the plane flying to indianapolis, indiana and it made my experience that much more real and enjoyable. i could actually feel the hot summer air (but not the snow because like… it’s summer right now and it’s HOT).